Virtually any 256 GB or larger USB 3.0 drive will be supported. Next month's Xbox One system update will have a number of new features and tweaks, but two in particular stand out to us, and of course to Major Nelson. In a preview post for Xbox Wire, Major Nelson detailed two of the June updates more outstanding features: External storage support, and real name display. 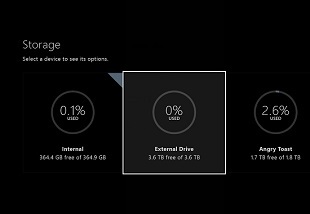 Once the update is installed, you'll be able to connect any USB 3.0 external hard drive to your Xbox One that's 256 GB or larger. Once formatted for the Xbox One, the drive can be used for media, game installs, apps, and save files. You'll also be able to connect the drive to other Xbox One consoles and access its content, so long as you grant permissions accordingly (inserting a game disc, or signing into Xbox Live, depending on the content). With external USB 3.0 drives getting cheaper every day ($70 for 1 TB? Pretty solid deal!) this should make storage relatively cheap, and easy to manage -- no more deleting game installs to make space. The real name update is also noteworthy, as you'll finally be able to display your real name to any specific group of friends (all of them, certain groups, friends of friends). Your real name will never show up in-game, either, so anonymity is maintained where it matters most. Other incoming updates include new SmartGlass features, and the much-hyped detachment of entertainment apps from the Xbox Live pay wall.